A while ago I took off running through a commercial area behind the hotel where I was staying while doing a parish mission. 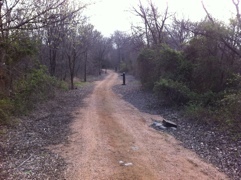 I discovered a nice jogging trail through the woods so I swung onto the trail and headed through the trees. 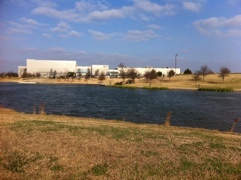 Soon I came into the open to see a beautiful lake. A sign caught my eye. 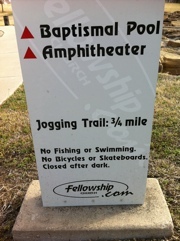 It had an arrow pointing to “Baptismal Pool.” I kept running. Sure enough a little distance ahead there was an elaborate structure with seats, railings and a ramp down into the lake. 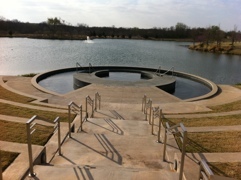 It was obviously designed for full immersion baptisms (see pictures). I looked back at the baptismal pool and remembered my upbringing in modest Baptist churches. They didn’t have lakes with elaborate ramps down to the ducks and white egrets sharing the water. We had huge bathtubs behind the pulpit where people were immersed after church services – all wearing white robes and holding their noses. But what does baptism do for these good meaning folks? According to their theology baptism does nothing – it’s not even necessary. Jesus commanded it so they do it but nothing happens. It was just an external act we did to show the world (even if it was in the privacy of our little church) that we had believed on Jesus. I know because I was raised this way and later passed on the Baptist tradition myself. 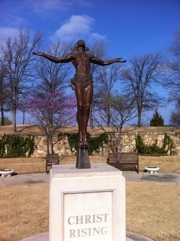 Of course evangelicals condemn Catholics as unbiblical for teaching that obeying Christ in baptism actually does something – bringing about new birth (John 3:5), washing away sins (first words Paul heard from Ananias when he hit the dust, Acts 22:16), and incorporating us into the death and resurrection of Jesus (Romans 6:1-5). I continued running around the next curve and stopped again. There in front of my eyes was was a big outdoor statue. I took a double-take, blinked and looked again. Yup, it was a statue! A statue of Jesus ascending to heaven! Evangelical mega-church? It brought to mind the inconsistency of Protestants, remembering my Baptist mom’s little statue of Mary and Jesus on our table at Christmas, part of the nativity scene. 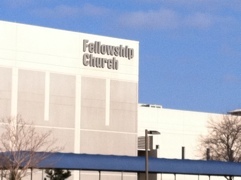 If I was staying over the weekend I’d have visited this “church” just as an observer out of curiosity. I’d follow the arrow to “worship space.” I’m not sure whether I’d buy a cappuccino or an espresso to enjoy while watching the worship show entertainment. I would not want to be the only one with an empty cup holder in my theatre-style seat. After shaking my head and wiping the sweat from my brow I ran back to the hotel to pack and fly back home after giving a Catholic Parish Mission. I prayed a quick prayer along the way – while huffing and puffing – and thanked Our Lord for His Catholic Church and for opening the eyes of one more unworthy servant. This is a heart-wrenching, yet beautiful story of a wife and mom with cancer and how she’s decided to deal with it. She’s a inspiration to us all – living in the heart of her family, God and the Church. For other beautifully crafted Catholic and personal videos by Fr. Josh and Lolek Productions, click HERE. For update on her condition, click here.